The community of Manette encompasses the southern point of East Bremerton on what is often called the Manette Peninsula. Surrounded by Port Orchard, Manette is connected to downtown Bremerton via the Manette Bridge over Port Washington Narrows. Homes for sale in Manette are both new and established single family houses overlooking scenic vistas of the water, mountains, and bridge. Within minutes, residents can drive to the Seattle ferry, Naval Base Kitsap-Bremerton, Puget Sound Naval Shipyard, shopping, and schools. 3 Beds | 2.25 Baths | 2040 sq. Ft.
5 Beds | 2.75 Baths | 3392 sq. Ft.
3 Beds | 2.5 Baths | 1728 sq. Ft.
4 Beds | 2.5 Baths | 2111 sq. Ft.
3 Beds | 2.5 Baths | 1924 sq. Ft.
3 Beds | 2.5 Baths | 1930 sq. Ft.
3 Beds | 2.5 Baths | 1939 sq. Ft.
Blue Summit Realty has the most accurate and up to date Manette real estate listings on the web. Currently there are 23 homes for sale, and 1 vacant land properties in Manette. Of the 24 total Manette residential listings for sale 0 are bank owned, 0 are short sales, 0 are new construction, and 0 are townhomes. The price ranges from $205,000 to $0 with a median list price of $329,888 and median sold price of $314,543. Make sure to refine your Manette real estate search by property type, price, square footage, bedrooms, bathrooms and more with the search tool above or view the Manette listings on our interactive map. 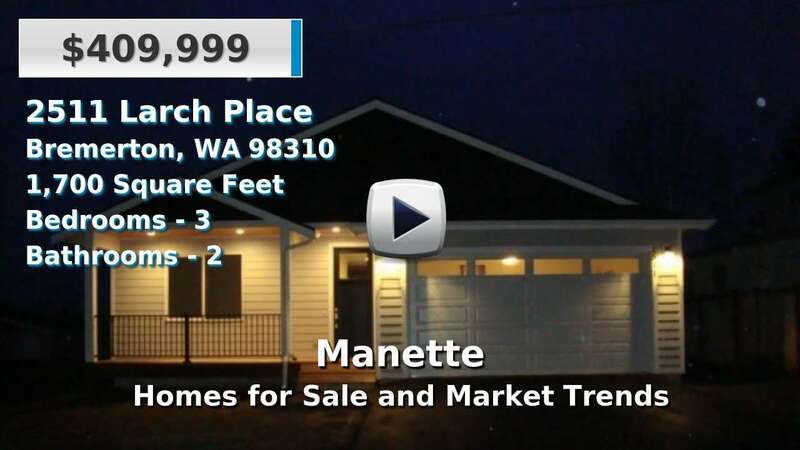 Our Manette real estate listings were updated 14 minutes ago.